Hi-Res Audio hits the mainstream in our Android-powered Sony Walkman NWZ-F886 review, but can it do anything your smartphone can't already? At last, Walkman takes on iPod as the maker adds Hi-Res Audio playback to the new Sony Walkman NWZ-F886, offering up to six times the audio information of CD and way more than anything in the iTunes store. Large file sizes have their drawbacks as we shall see, but with a 10.2cm Triluminous touchscreen, NFC communication and Android 4.1 running the show, this mid-priced music player appears to trump the Apple iPod Touch. As thin black touchscreen devices go, the Sony NWZ-F886 is pleasingly tactile with its all-glass front and subtly textured plastic back panel, but you won't find the leather trim or metal casing reserved for the range-topping Sony Walkman NWZ-ZX1. At half the price, that's to be expected, but what is surprising is the lack of any Hi-Res Audio branding, other than a sticker that looks like it is meant to be peeled off. The external speaker has been cleverly incorporated into the Walkman logo at the back and you'll find a headphone mini-jack and flattened USB cable port on the bottom. Being an Android device, it is touchscreen controlled, but there are also tiny hard buttons for the basic playback controls and volume to be found along one side. The Sony NWZ-F886 is essentially a 32GB music player that's also able to read high-resolution audio files that are less compressed than MP3s and, therefore, have the potential to sound more detailed and realistic. So that includes WAV(192KHz/24bit), AIFF(192KHz/24bit), FLAC(192KHz/24bit) and Apple lossless(192KHz/24bit), but doesn't for some reason include all DSD files. The Hi-Res Audio standard Sony refers to seems more a tangled web of compression codecs and file types that may or may not play on your Hi-Res Audio device. Maybe that's why the logo is a removable sticker rather than etched into the casing. In any case, you won't find them on iTunes. The LED display is the same size as that of an iPod Touch and while it cannot match Apple's Retina Display, it looks very bright and vivid. The supplied headphones are better quality than the standard issue Apple EarPods, but they still can't quite match the wide bandwidth of high-resolution audio tracks, so you'd be advised to upgrade them to hear more of your music. 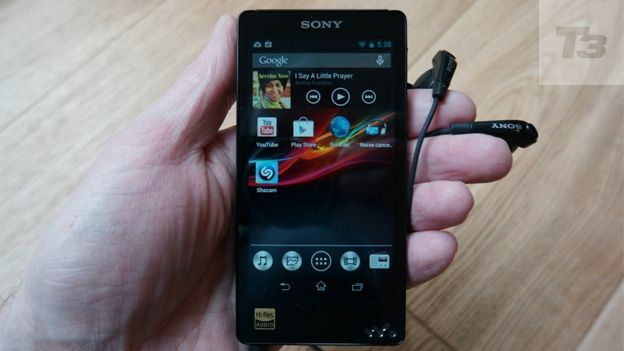 Running Android 4.1 with no Walkman skinning makes the Sony NWZ-F886 easy to operate, but also means that it looks like a phone when you switch on and unlock it. You can download apps and games in the usual way, while the music icon is just one of four along the bottom, so it doesn't look like the dedicated music player for hi-fi purists it claims to be. Unlike the Walkmen of the past, it plays nice with both Macs and PCs and there's no dreadful Sony software to grapple with. Attach the USB cable and folders simply appear on your desktop into which you drag and drop your music files. It's only when you come to listen to music on the Sony NWZ-F886 that it becomes apparent why someone might buy this rather than simply listening to their smartphone. The sound quality is slightly better than an iPhone 5 in every respect. Even MP3s are improved by Sony's Digital Sound Enhancement Engine (DSEE) HX, with more depth and scale to the soundstage, so your music seems to fill your headphones with an expansive sound. Certainly it is louder, but also clearer and punchier through Sony's ear buds. There's less hiss too thanks to the Digital Noise cancellation. The Sony NWZ-F886 really comes into its own when you load up some lossless 192KHz/24bit files. You'll need to enter the esoteric and often expensive world of hi-res audio music to find them, but Sony's High Resolution Audio Hub [http://www.sony.co.uk/hub/high-resolution-audio ] will point you in the right direction. Swapping the unremarkable Sony earbuds for reference-quality Sennheiser HD800 headphones you can really hear the lossless versions of the same songs soar. There's a wider dynamic range that delivers more detail in the treble and more impact and weight to the bass, while vocals and mid-range instruments stand out in a much more realistic way. Be warned, you might find it had to go back to compressed MP3 files after tasting the delights of such audiophile-grade encodes. The battery life is quoted at 32 hours of playback, but only 26 hours when listening to high-resolution audio, so it's worth noting that not only do such files take up considerably (more than twice as much) data, but they use more battery power too. That said, it will last longer than any smartphone battery. There's no denying that the Sony NWZ-F886 sounds great with MP3s and even better with high-resolution audio and it's certainly a clever and compact device. But why, when smartphones like the Samsung Galaxy Note 3 and LG G2 can also play Hi-Res Audio tracks, would you buy a second device? Running Android 4.1 makes it look and feel like a low-spec phone that can't make calls and hi-fi purists are not going to believe that it's a dedicated music player if it also plays Angry Birds. W'íre delighted to see Sony pushing sound quality, but there's a long way to go before Hi-Res Audio gains mass market appeal.